Wiesbaden, Germany, 2018-Aug-28 — /Travel PR News/ — “Sea” more of Europe than ever before: Norwegian Cruise Line is proud to present its new brochure with sailings through April 2020. The compilation focuses on the new itineraries of Norwegian Pearl, which will be the sixth ship to be positioned in Europe during the summer. With this move, the international cruise line is undertaking its largest European campaign in the company’s history. At the beginning of the season, starting May 11, 2019, Norwegian Pearl guests can enjoy four sailings from/to Amsterdam: A 15-day cruise will visit Norway for example via Newhaven (Edinburgh) and Invergordon, Dublin, Le Havre, Tilbury near London and Zeebrugge. Another itinerary via Warnemünde features the highlights of the Baltic Sea: In addition to capitals such as Helsinki, Stockholm, Tallinn, Riga and Copenhagen, the cruise also includes a two-day stay in Saint Petersburg and stops in smaller destinations such as Gdynia (Gdańsk) and Klaipėda. In July, Norwegian Pearl moves to the Mediterranean and takes passengers on different sailings from Rome (Civitavecchia), Barcelona and Venice, among others, to less-traveled cruise destinations such as Kotor in Montenegro, Zadar in Croatia, and Monaco. New to Northern Europe is Norwegian Spirit, which offers 10 to 15-day trips from Southampton (London) to Scotland, Ireland, Iceland, Norway and the Baltic Sea. The European fleet is completed by Norwegian Getaway from/to Copenhagen with stops in Helsinki and Stockholm among others, Norwegian Epic from/to Civitavecchia and Barcelona, Norwegian Jade from Civitavecchia and Venice, and Norwegian Star from Venice. Other news in the brochure includes the new itineraries of Norwegian Joy, which replaces the smaller Norwegian Pearl in Alaska. From April 27 to September 28, the ship will depart Saturdays from Seattle to Juneau, Ketchikan and Skagway, or Hoonah (Icy Strait) in Alaska, with passages through Glacier Bay or Holkham Bay, and to Victoria in Canada. Together with Norwegian Bliss, currently the newest ship in the NCL fleet, and Norwegian Jewel, the international cruise line’s guests will find a wide selection of Alaska dates and itineraries available. NCL also has new itineraries ready for the 2019/2020 winter season: Each Sunday from November 2019 to April 2020, Norwegian Encore will bring guests to the Eastern Caribbean for a seven-day cruise from/to Miami during the ship’s maiden season. The 17th ship of the Norwegian Cruise Line fleet will be delivered by Meyer Werft at the end of October 2019. Other exotic destinations also feature on the winter schedule: Norwegian Joy cruises along the Mexican Riviera and Panama Canal, Norwegian Jewel travels across the South Pacific back to Australia and New Zealand, and, for the first time, Norwegian Jade spends the entire winter in South East Asia. 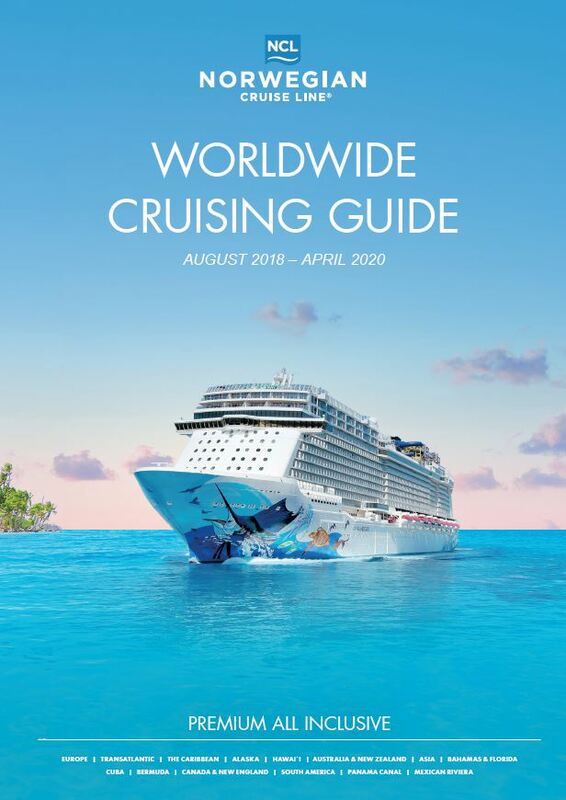 Cruise enthusiasts will also find all worldwide itineraries of Norwegian Cruise Line in the new brochure, as well as comprehensive information on fly & cruise packages, insurance coverage and the offerings on board. A cross-section of Norwegian Getaway gives a visual impression of the manifold possibilities to put together your very own daily routine on board a Norwegian Cruise Line ship. The numerous benefits of the Premium All Inclusive offer are also presented in detail. The new brochure can be viewed and ordered online at: www.ncl.eu/brochures. Norwegian Cruise Line is the innovator in cruise travel with a 51-year history of breaking the boundaries of traditional cruising. Most notably, Norwegian revolutionized the cruise industry by offering guests the freedom and flexibility to design their ideal cruise vacation on their schedule with no set dining times, a variety of entertainment options and no formal dress codes. Today, Norwegian invites guests to enjoy a relaxed, resort- style cruise vacation on some of the newest and most contemporary ships at sea with a wide variety of accommodations options, including The Haven by Norwegian®, a luxury enclave with suites, private pool and dining, concierge service and personal butlers. Norwegian Cruise Line sails around the globe, offering guests the freedom and flexibility to explore the world on their own time and experience up to 27 dining options, award-winning entertainment, superior guest service and more across all of the brand’s 16 ships. For the entire European market, the international cruise line offers its comprehensive Premium All Inclusive concept which already includes, among other things, a wide selection of alcoholic and non-alcoholic beverages, service charges and gratuities on all-inclusive services as well as 60 minutes of free Wifi per person in the cruise fare. In July 2018, Norwegian Cruise Line was awarded the coveted World Travel Award for Europe’s Leading Cruise Line for the eleventh time in a row. The newest fleet member, Norwegian Bliss, made its debut in April 2018. Additionally, Norwegian Cruise Line has commissioned Meyer Werft to build another Breakaway Plus class ship: Norwegian Encore will depart Miami for the Caribbean after its maiden voyage in the fall of 2019. And finally, Norwegian Cruise Line commissioned Fincantieri S.p.A. with the construction of six ships of the new Leonardo generation, which are scheduled to be delivered from 2022 to 2027. Six of the cruise line’s modern ships will sail European waters in the summer of 2019. This entry was posted in Cruises, Luxury, Travel, Travel Services, Travelers and tagged brochure, Kevin Bubolz, Norwegian Cruise Line, sailings. Bookmark the permalink.